Tourism Corporation Bonaire is recognizing visitors that have been visiting Bonaire year after year. Bonaire has an average of 40% repeat visitors. 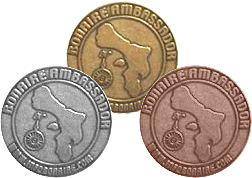 The Bonaire Ambassador program was created with the purpose of recognizing Bonaire’s loyal visitors with an official certificate and ambassador medal. With this recognition visitors become official Bonaire ambassadors.